CMOs and Marketing VPs today are primarily focused on three goals: connecting to new customers, building customer loyalty, and clearly demonstrating the value of marketing. These goals are not new; what's new are the tactics used to achieve them. The Internet, social media, and mobile technology have changed the way customers learn about businesses, purchase products, and interact with companies. But these technologies have also given CMOs new tools for engaging with customers and improving the effectiveness of their marketing programs. 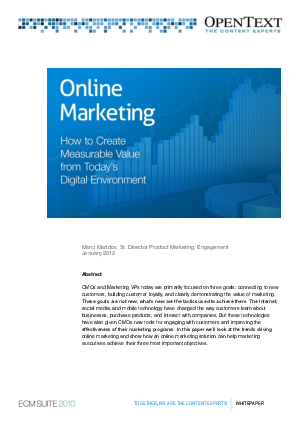 In this paper we'll look at the trends driving online marketing and show how an online marketing solution can help marketing executives achieve their three most important objectives.